This is no ordinary Stomp Rocket, this is the Ultra Stomp Rocket. What makes it Ultra? I have no idea, but I do know this is a cool little toy. Actually, I think it is Ultra because the rockets are a little bigger and go a little higher than the junior version. When you get your hands on this kit, you will agree that it’s the best stomp rocket on the market This toy is a lot of fun and we have spent hours playing with this thing at our house. It is about as simple of a toy as you will find. 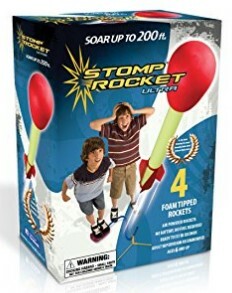 You stomp on the launch pad which uses the air blast to propel the stomp rocket about 200 feet in the air. It comes with a flexible tube which is connected to a rectangular stomp pad made of plastic. The tube may look like one of those you’ll see in the best stethoscope 2018 models. The tube end is then connected to one of the foam rockets. There is also a small plastic stand which serves as the launch pad. The smile on a baby’s face is just to die for. A perfect baby doll to act as a companion for your little one can make this smile last forever. Here are 12 dolls that will create a lasting impression on your kid’s social behavior. Not only is this sweet doll affordable than most others, it also makes for the perfect starter doll for your baby. She comes with a teddy bear for cuddling and her own pacifier. The Baily baby doll will boost your little one’s self-esteem as she can practice taking care of a ‘baby’. Your babh can change her wet diaper after a bottle. The doll also comes with a stethoscope and a thermometer for doctor checkups. No other doll will make your new mom feel so much affection like Jenna. Her face, legs and arms wipe clean and she is easy to carry around. It will definitely be love at first sight when your baby meets Jenna. No child’s toy chest would be complete without a Say Please Tea Set. Toy tea sets have been around forever, but this a much improved tea set specifically geared toward babies and toddlers. The Say Please Tea Set is full of musical surprises that every baby loves. The musical fun starts when you open the tea pot lid and hear a greeting and different sounds. Pressing the tea bag will get more sounds and a sing-along song. The Say Please Tea Set helps little ones in developing their social skills. The sing-along songs teach things about sharing and manners. It has 3 tea time treats in the shape of a circle, square, and triangle, fitting perfectly on the matching sections of the serving plate to encourage problem-solving play and shape sorting. There are 3 play modes: imagination, music, and learning. It has 3 “teethable” cookies, 2 tea cups, and has 3 songs built in. To help your little one begin to associate words with actions you can try talking as you play. You can say things like, “Can you open the lid?” or “I am pouring tea into the cup”. Another option is to count the treats as you place them on the serving tray. You can also just step back and let your little one have at it. You might also invite some dolls to join you in the fun. If you’ve got a little rock star in your house then you need this toy. Any kid who loves to sing and pretend to be a rock star will love this. It’s basically a microphone and an effects mixer, but it is specifically designed to work with the most popular songs. It comes preloaded with 2 songs, but you can also add your own. Any song will work, but in order to be able to fully utilize all the effects then you need the songs that are on their list of songs. Don’t worry if that sounds limiting. There are new songs added all the time and if you want a specific song that they don’t have then they have a request form on their site and you can request any song. In order to add your own songs you have to go to their website and download a free app. They have an app for Windows or Mac computers. It’s really simple to do. So when you go to look up what songs are fully functional with the system, if you already own the song, then you just use the app to put the song onto your WowWee Paper Jamz Pro Mic. It has an Auto Mode which will automatically adjust the effects while you are singing so that you can sound just like the original song. It also has some really cool voice effects like Perfect Pitch, Chorus – which adds depth to your voice, Auto Vibrato, Melody Match – which tunes your voice so that you are always singing a perfect melody for that song, and Auto Harmony – so you can make the song sound like an amazing duet. Finally someone is helping us keep our iPhone’s and iPod’s safe from our sticky-fingered, drooling, adorable children. Thank you Fisher Price! This is one of the best products since sliced bread. I’ve been looking forward to the Laugh and Learn Apptivity Case Review for a long time. Let’s check it out. With all the kid friendly apps on the iPhone and iPod they are a great way for kids to entertain themselves, but the problem is… our kids are entertaining themselves with our iPhone, that thing is expensive. It’s not normally a gadget you would just hand to your 2 year old and say, “Here you go, have fun”. Well, thanks to Fisher Price, now you can. The Laugh and Learn Apptivity Case is the perfect way to allow your kids to enjoy all those fun apps, but still keep your phone safe. All you do is put your Apple gadget into the case and twist to lock it in. The Laugh and Learn Apptivity Case has large handles for easy gripping, teething rings, and even a mirror on the back. One of the features I love the most is that the “Home” button is covered up. It gets really frustrating when your kids keep accidentally hitting the home button and taken out of the app. It’s inexpensive, so you just can’t go wrong with the Laugh and Learn Apptivity Case. Much better than having to replace your Apple device because it got dropped or drooled on to much.